Hepatitis C virus (HCV) infection affects 71 million people worldwide1 and is a leading cause of death globally.2 Prior to the approval of oral combination direct-acting antivirals (DAAs) in 2014, all recommended HCV treatments included pegylated-interferon α (PEG-IFNα) and ribavirin (RBV). In a recent systematic review and meta-analysis on hepatitis C treatment rates, however, it was estimated that only 25% of patients with chronic HCV infection worldwide were treated with these immune-based therapies.3 Treatment rates were likely limited by a number of factors, including the significant rates of side effects, the lack of adequate numbers of specialist providers, the fact that these therapies were contraindicated in patients with decompensated liver disease, and limited efficacy, particularly in patients with HIV/HCV co-infection or those with advanced liver disease. Now, interferon-sparing combination DAA regimens have dramatically improved the treatment of HCV, with higher treatment efficacy, improved tolerability, and ease of dosing, with the majority of regimens available in once daily oral dosing.4 With the first published trials showing comparable response rates to combination DAA-based HCV treatments when given with and without RBV, it has been suggested that RBV-sparing regimens would improve treatment safety, tolerability, and adherence.5–7 However, there are several clinical scenarios and treatment regimens in which the addition of RBV is still recommended. Here, we discuss the data behind the current guidelines regarding the use of RBV in the revolutionary age of DAA-based treatment for HCV. RBV is a synthetic triazole guanosine analog with activity against both DNA and RNA viruses.8,9 Suggested mechanisms of RBV include modulation of T helper-1 and -2 lymphocyte imbalance, depletion of cell guanosine triphosphate by inhibiting inosine monophosphate dehydrogenase, inhibiting the viral RNA-dependent RNA polymerase, impairment of translation by preventing the capping of messenger viral RNA, and lethal viral mutagenesis (Fig. 1).8,9 Before the introduction of RBV, PEG-IFNα was the only available treatment for HCV, achieving low rates of sustained virologic response (SVR)—defined as absence of plasma HCV RNA in blood at 12 or 24 weeks after stopping treatment—of 15–20%.8 The addition of RBV to PEG-IFNα was shown to be superior to the use of PEG-IFNα alone,8,10–13 with an increased SVR rate of approximately 30%8,10 among patients who received a regimen with RBV. The combination of PEG-IFNα and RBV also reduced the risk of post-treatment viral relapse.8 In a study by McHutchinson et al.,8 relapse rates were reduced by 38% in patients who received PEG-IFNα and RBV for 24 weeks and by 22% in those who received the regimen for 48 weeks.8 Due to higher efficacy and decreased rates of relapse compared to PEG-IFNα regimens alone, PEG-IFNα in combination with RBV became the standard of care for hepatitis C treatment in the 1990s and early 2000s. Fig. 1. Proposed mechanisms of RBV. (1) Immunomodulation favoring TH2 over the TH1 phenotype to enhance host immunity to the virus. (2) Competitive inhibition of IMPDH and subsequent depletion of the GTP pool, limiting replication of viral genomes and viral protein synthesis. (3) Inhibition of post-translational mRNA capping by directly inhibiting viral mRNA polymerase. (4) RBV acts as a mutagen in the target virus. Abbreviations: IMPDH, inosine monophosphate dehydrogenase; RMP, ribavirin monophosphate; RDP, ribavirin diphosphate; RTP, ribavirin triphosphate; TH1, T helper 1; TH2, T helper 2. In May 2011, the FDA approved the protease inhibitors boceprevir and telaprevir, which were found to increase the rates of SVR 12 weeks after end of treatment (SVR12) when combined with PEG-IFNα and RBV,18,19 and the standard of care for hepatitis C treatment shifted to include one of these oral medications in combination with PEG-IFNα and RBV. Though the protease inhibitors greatly improved HCV treatment, their use was restricted by complicated dosing strategies requiring response-guided therapy and lead-in treatments, a low genetic barrier to resistance, and extensive drug-drug interactions. In 2013, the second generation of DAAs, which included the nucleotide analogue sofosbuvir (SOF), came to the forefront of HCV treatment. When combined with PEG-IFNα and RBV, treatment with SOF produced SVR12 rates in excess of 90%.6,20–22 Daclatasvir (DCV), a non-nucleoside RNA polymerase inhibitor, in combination with PEG-IFNα and RBV also demonstrated high antiviral potency.23 In light of these near total response rates, investigators began to hypothesize that use of RBV could be eliminated altogether. Several studies published in 2014 demonstrated that RBV-free treatment regimens, composed of only DAAs, were highly efficacious. The first, by Sulkowski et al.7 (AI444040 Study), treated 211 patients with either genotype (GT) 1, 2, or 3 infection with a combination of DCV and SOF with or without RBV for varying treatment durations, including 12 and 24 weeks. Among the GT1 treatment-naïve patients, a combination of DCV and SOF for 12 weeks produced SVR12 rates of 100% (41/41), compared to a 95% (39/41) SVR12 rate in those patients treated with DCV+SOF+RBV for 12 weeks. Among the GT1 patients who had failed previous treatment with a protease inhibitor, SVR12 rates were 100% (21/21) in patients treated with DCV+SOF for 24 weeks, and 95% (19/21) for patients treated with DCV+SOF+RBV for 24 weeks. Similarly, among patients with GT2 or GT3 infection, the addition of RBV did not result in a significantly higher virologic response rate; SVR12 was 100% (14/14) and 86% (12/14) for patients who were administered the RBV-sparing and RBV-inclusive regimens, respectively.7 The lower SVR rates seen with the RBV-inclusive regimens may reflect the high potency of DCV and SOF, indicating that RBV does not add to the potency of these oral DAAs. A second study, LONESTAR,6 assessed treatment of GT1 infection in patients who were treatment-naive or previously treated with a protease-inhibitor regimen. There were 19 treatment-naïve patients treated with LDV/SOF for 12 weeks, and 18 (95%) achieved SVR12. Among 21 patients who had failed previous treatment with a protease inhibitor, all (100%) achieved SVR12 after 12 weeks of LDV/SOF+RBV and 18 of 19 (95%) patients treated with LDV/SOF alone achieved SVR12. In a phase 3 study by Afdhal et al.5 (ION-1), 865 treatment-naïve patients with GT1 infection were randomized to receive LDV/SOF for 12 weeks, LDV/SOF+RBV for 12 weeks, LDV/SOF for 24 weeks, or LDV/SOF+RBV for 24 weeks. The rates of SVR12 were 99% in the group that received 12 weeks of LDV/SOF, 97% in the group that received 12 weeks of LDV/SOF+RBV, 98% in the group that received 24 weeks of LDV/SOF, and 99% in the group that received 24 weeks of LDV/SOF+RBV. Last, a phase 2b study24 evaluated the efficacy of a NS3/4A protease inhibitor (ABT-450) boosted with ritonavir (ABT-450/r), a non-nucleoside polymerase inhibitor (ABT-333), and a NS5A inhibitor (ABT-267) in various combinations with or without RBV. A total of 571 non-cirrhotic patients with GT1 infection (438 treatment-naive and 133 treatment-experienced) underwent randomization to receive a regimen of ABT-450/r, combined with ABT-267 and/or ABT-333, for 8, 12 or 24 weeks and received at least one dose of therapy. All the subgroups but one also received RBV (dose determined according to body weight). When comparing the SVR12 rate of the group that received all three drugs without RBV for 12 weeks and the group that received all three drugs with RBV for 12 weeks (89% vs. 96%, respectively), the contribution of RBV was not significant (p = 0.09). These studies suggest that adding RBV to DAAs does not result in significantly higher SVR12 rates, and are summarized in Table 1. Studies directly comparing DAAs are lacking, but a recent meta-analysis25 comparing different DAA-based regimens, with and without RBV, showed no improvement in treatment efficacy among DAA regimens that included RBV over those that were RBV-sparing. In addition, treatment regimens that incorporated RBV had a higher relative risk of adverse events, including anemia and fatigue. These studies support limiting the use of RBV, given the lack of increase in efficacy and more frequent toxicity. However, as we explore below, there are scenarios in which the addition of RBV to a DAA-based regimen might be warranted. There are several scenarios and patient groups in which the use of RBV is necessitated, as outlined below and summarized in Table 2. RBV has been efficacious when used in regimens for both treatment-naïve and treatment-experienced patients with GT1 infection. The daily fixed-dose combination of paritaprevir, ritonavir, ombitasvir, and dasabuvir (PrOD), for example, is an alternative regimen approved for treatment-naïve GT1a and 1b patients with or without cirrhosis when given with weight-based RBV. The efficacy of RBV when added to PrOD for HCV treatment, especially in GT1a patients, was demonstrated in three trials. In the SAPPHIRE-I trial,26 631 treatment-naïve, non-cirrhotic patients with GT1 infection were treated with PrOD+weight-based RBV for 12 weeks. Rates of response were more than 95% among the treatment-naïve patients with GT1 infection. Additionally, in the PEARL-IV study, Ferenci et al.27 evaluated the efficacy of patients treated with PrOD with or without RBV. While there was no difference in rates of virologic failure with or without RBV among the GT1b patients, among the GT1a patients the rate of virologic failure was higher in the RBV-free group compared to the RBV group (7.8% vs. 2.0%). Last, for patients who had previously been unsuccessfully treated with PEG-IFNα and RBV, the SAPPHIRE-2 study28 examined the use of PrOD with weight-based RBV in non-cirrhotic GT1 patients. In that study, patients were treated for 12 weeks and had an overall SVR12 rate of 96%, with no differences noted when comparing response rates between subtypes. RBV is also used to augment the SVR rate in patients who have baseline HCV resistance, when added to the fixed-dose combination of elbasvir (EBR) and grazoprevir (GZR). In the phase 3 C-EDGE trial,29 an international multicenter study, a 12- or 16-week course of EBR/GZR was given to treatment-naïve patients infected with HCV genotypes 1, 4 or 6, some of whom had compensated cirrhosis. Of the 421 patients, 382 (91%) had GT1 infection. The SVR12 was 92% in GT1a patients and 99% in GT1b patients. However, a post-hoc subanalysis revealed that the presence of baseline NS5A resistance-associated substitutions (RASs) was significantly associated with a decreased virologic response among GT1a patients; of 154 GT1a patients, 19 (12%) had baseline NS5A RASs, and of these 19, only 11 (58%) achieved SVR12 compared to 133/135 (99%) patients without NS5A RASs. Kwo et al.30 extrapolated data from the C-EDGE trial and found that among 58 patients who received EBR/GZR for 16 weeks with RBV, there were no virologic failures. Based on these analyses which suggest that prolonging treatment and adding RBV can overcome reduced EBR susceptibility, NS5A resistance testing is recommended for any GT1a patient in whom EBR/GZR therapy is considered. Use of RBV for the presence of baseline RASs is also recommended for treatment-experienced patients with GT1 infection (with or without cirrhosis), based on the phase 2 C-SALVAGE study.31 In this study, 79 patients, 66 of whom (84%) had previously been treated with a regimen containing a protease-inhibitor, were given 12 weeks of EBR/GZR and weight-based RBV. At entry, 34 patients (43%) harbored NS3A RASs, identified by population sequencing. Response rates were high, with 76/79 (96.2%) achieving SVR12, including 63/66 (95.5%) in patients with prior virologic failure, 31/34 (91.2%) in patients with baseline NS3 RASs, and 32/34 (94.1%) in cirrhotic patients. The presence of NS5A or dual NS3/NS5A RASs was associated with lower SVR12 rates (75% and 66%, respectively), but since only 3 patients had virologic failure, firm conclusions could not be drawn. The findings from the C-EDGE and C-SALVAGE trial led to the recommendation that RBV should be added to the combination of EBR/GZR and treatment should be extended to 16 weeks in GT1a patients with or without cirrhosis, if baseline RASs are detected (i.e. substitutions at amino acid positions 28, 30, 31 or 93). Also, in GT1 patients with cirrhosis who are treatment-experienced with PEG-IFNα and RBV regimens, the addition of RBV can reduce the duration of retreatment when using LDV/SOF. The phase 2 SIRIUS trial32 compared 24 weeks of LDV/SOF with 12 weeks of LDV/SOF+RBV in treatment-experienced patients with GT1 and compensated cirrhosis. Both regimens had similar SVR12 rates, with 96% in the LDV/SOF+RBV group and 97% in the LDV/SOF alone group. This study’s findings increased options for GT1 treatment-experienced patients with cirrhosis by providing a regimen option with a shorter duration. In GT3 treatment-experienced patients, RBV is an important component of all currently recommended retreatment regimens. In a study by Planko et al.,33 96% (n = 26) of GT3 patients with compensated cirrhosis who were PEG-IFNα and RBV-experienced were successfully retreated with a 12-week duration of SOF/velpatasvir (VEL)+weight-based RBV, as compared to only 88% of those who received SOF/VEL alone (n = 26). PEARL-I was a randomized, open label trial that evaluated the efficacy of paritaprevir, ombitasvir, and ritonavir (PrO) with or without RBV in treatment-naïve and treatment-experienced non-cirrhotic patients with GT4 infection.34 In 86 treatment-naïve patients, SVR12 rates were 100% (42/42) for the RBV-containing regimen and 90.9% (40/44) for the RBV-free regimen. There were 49 treatment-experienced patients who received the RBV-containing regimen, and all achieved SVR12. The PEARL-I trial demonstrated the efficacy of RBV for virologic cure in treatment-naïve and treatment-experienced GT4 patients. The ASTRAL-435 study was the first to compare the use of DAAs both with and without RBV in patients with decompensated cirrhosis and demonstrated the utility of RBV in achieving high SVR12 rates when combined with 12 weeks of SOF/VEL. Regardless of genotype, rates of viral response exceeded 85% when SOF/VEL was combined with RBV; this combination also resulted in the lowest rates of virologic failure for patients with GT3 (other studies have shown that SVR12 rates with GT3 are lower than rates for other genotypes).35 The SOF/VEL+RBV regimen was compared to SOF/VEL alone, each for 12 weeks, and SOF/VEL for 24 weeks. The response rate in the 12-week SOV/VEL+RBV arm was 94%, compared to 83% in SOF/VEL alone for 12 weeks and 86% in the SOF/VEL 24-week arm. Out of 267 patients treated in that study, 72 had pre-treatment NS5A RASs. Among these 72 patients, 64 (89%) had SVR12 compared to 169 of 183 patients (92%) who did not have pre-treatment NS5A RASs. In the SOF/VEL 24-week arm, the presence of NS5A RASs affected virologic cure, as the SVR12 among those with pre-treatment NS5A RASs was 90%, compared to a 98% SVR12 rate for those who had no pre-existing NS5A RASs. In addition, among the patients with GT1 who received SOF/VEL+RBV, the SVR12 rate was 100% for those who had NS5A RASs and 98% for those who did not, demonstrating that RBV is an important adjunct to increase the rate of virologic cure with a 12-week regimen in patients with baseline resistance. Based on the ASTRAL-4 study, the benefits of RBV in patients with decompensated cirrhosis include augmenting viral response, increasing the potency of HCV regimens in order to shorten treatment duration, and serving as a salvage treatment option for those patients in whom HCV treatment is of top priority in order to decrease risk of hepatocellular carcinoma and overall mortality. 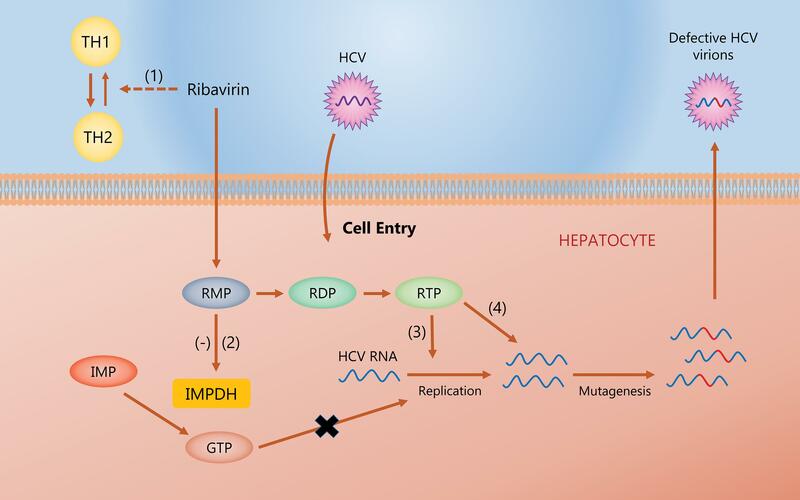 For patients who are post-liver transplantation (with or without HCV treatment experience and/or compensated or decompensated cirrhosis) and infected with HCV 1, 4, 5 or 6, the only recommended, evidence-based regimen for treatment which includes RBV is in combination with LDV/SOF for 12 weeks. The evidence for use of RBV with LDV/SOF is provided by three studies. The SOLAR-136 study was a USA-based, phase 2, open-label study assessing LDV/SOF+RBV in patients with GT1 or 4 infection in two cohorts, one of which included patients who were post-liver transplant, with or without cirrhosis (Child-Pugh class A, B, or C). All of these patients were randomized to receive either 12 or 24 weeks of LDV/SOF with RBV. SVR12 rates among patients without cirrhosis and compensated cirrhosis were 96% and 98%, respectively. These rates were not affected by duration of treatment or cirrhosis status. In patients with Child-Pugh class B cirrhosis, the rates of SVR12 were similar with 12 weeks and 24 weeks of treatment (86% vs. 88%). Although there were lower SVR12 rates in patients with Child-Pugh class C disease (60% after 12 weeks of treatment and 75% after 24 weeks), this cohort was small (n = 9). Of note, 7 patients who had cirrhosis underwent liver transplant (4 before the end of treatment and 3 before post-treatment week 12). Six of 7 achieved SVR12; the seventh died of multiorgan failure and septic shock. Since SVR12 rates were similar despite duration of treatment (12 vs. 24 weeks) and only 4% of patients discontinued treatment due to adverse events from treatment drugs, this study led to the recommendation that 12 weeks of LDV/SOF+RBV is sufficient for patients after liver transplant. However, since all patients in the study received RBV, regardless of treatment duration, the role of RBV in higher SVR achievement could not be ascertained definitively from this study. Second, the observational cohort HCV-TARGET37 included 347 patients with liver transplants, 279 of whom received LDV/SOF for 12 or 24 weeks. The SVR12 rates were 97% (152/157) for those who received RBV and 95% (116/122) in the group that did not take RBV. Patients who received RBV were more frequently GT1a, treatment-experienced, and had intact renal function. The rate of therapy discontinuation was only 1.3%. Third, a multicenter cohort38 of 162 patients (mostly GT1) assessed response rates of LDV/SOF with or without RBV for 8, 12 or 24 weeks. Overall, 94% and 98% achieved SVR12 when receiving LDV/SOF without or with RBV, respectively. The SVR12 rate among patients who received 8 weeks of treatment was 86%, but did not differ greatly for 12 versus 24 weeks (94% vs. 95%). SVR12 rates in the RBV groups for 12 and 24 weeks was 97% and 100%, respectively. These studies suggest that high rates of SVR can be achieved without RBV; however, the addition of RBV may be considered for patients with an unfavorable baseline profile (i.e. cirrhosis, treatment-experienced). For patients with GT2 or GT3 infection (with or without HCV treatment experience and/or compensated cirrhosis), the ALLY-1 trial39 and that by Fontana et al.40 demonstrate that DCV/SOF+RBV for 12 weeks is an effective regimen. In the ALLY-1 trial,39 DCV/SOF+RBV was given for 12 weeks to 60 patients, both treatment-naïve and treatment-experienced, with Child-Pugh class A, B, or C cirrhosis after liver transplant. Eleven patients with GT3 were included in the trial; up to 83% (5/6) with advanced cirrhosis and 91% (10/11) with recurrent HCV after transplant achieved SVR12. In the study by Fontana et al.,40 the overall SVR12 rate with DCV/SOF+RBV (for all genotypes) was 91% (70/77). Only 3 patients had GT2 or GT3, and they all received DCV/SOF+RBV and achieved SVR12. There have been no studies in patients with decompensated cirrhosis after liver transplant, so the AASLD/IDSA guidelines4 recommend using DCV/SOF+RBV for 12 weeks or SOF/VEL with RBV for 12 weeks. More than 80% of the worldwide HCV burden is in low- and middle-income countries;41 however, treatment escalation in these areas has been hindered by the high cost of DAAs in developing countries.42 A study by Iyengar et al.43 analyzed and compared prices of DAAs in 30 countries, noting that people in developing countries had more risk of paying higher adjusted prices than people in developed countries. Furthermore, they noted the price of generic SOF was more than the annual earnings for individuals in 12 of the 30 countries they analyzed. The World Health Organization (commonly known as WHO) estimates that in Ukraine, for example, a 4-week course of PEG-IFNα and RBV is $139, compared to $812 for 4 weeks of LDV/SOF.44 These facts highlight the conundrum that although DAAs are more efficacious and have fewer side effects than PEG-IFNα /RBV regimens, the cost of DAAs remains prohibitive for most patients who need to be treated worldwide. Therefore, in resource-limited settings or countries with a low gross domestic product, RBV (in combination with PEG-IFNα) may be the only accessible treatment option at present based on cost, particularly for easier to treat genotypes. The WHO has established a goal to treat 80% of those with chronic HCV worldwide by 2030, an aspiration that, with the advent of combination DAA-based regimens, appears within reach for the first time.45 With the recent changes in the guidelines and use of DAAs in the treatment of HCV, regimens have become more tolerable, effective, and less complicated, enabling HCV to be treated by primary care and midlevel providers,46 with minimal laboratory monitoring. Therefore, the use of RBV should be restricted to patients who have failed previous regimens and/or have decompensated cirrhosis, as there is data to support use in these populations. In both instances, as more and more new regimens become available, RBV’s utility will need to be revaluated, since RBV use is associated with significant anemia in decompensated patients47 and end-stage renal disease,48 and retreatment studies are relatively small and restricted to a few regimens. Addition of RBV to all DAA regimens to treat HCV patients is not advisable and may be hazardous. While there may be disagreement about RBV’s efficacy and incidence of adverse events in the current era of HCV treatment,49 we recommend that the use of RBV should be limited to treatment in complicated patients who are managed under close supervision and should not be used to treat patients in primary care settings with uncomplicated HCV. Responsible for drafting the article (PM, EW), involved in the critical revision of the article (EW, SK). All authors reviewed and approved the version of the article submitted.